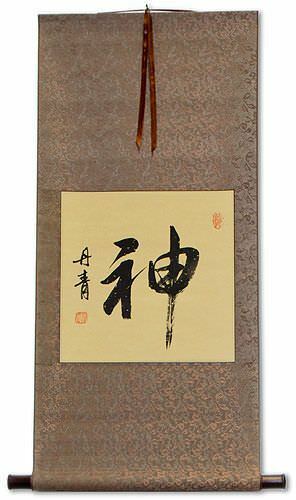 Buy a Divine calligraphy wall scroll here! 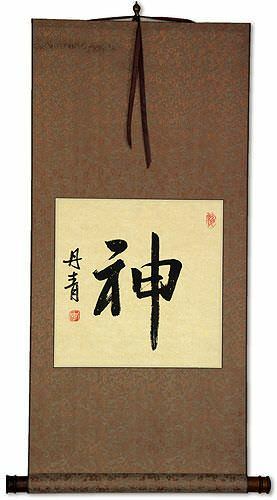 天佑 is a Chinese and Japanese word that means divine aid, divine grace, Heaven blessed, or providential help. Some Chinese people will use this to infer that this means a home or family blessed by heaven or God. 天佑 is the shortest way to express that idea anyway. This Chinese word means "divine light." This can refer to the glow or halo around the Buddha. It can also be a miraculous column of light. In slang, it can be like saying "jolly good!". 神風 is the famous title used during WWII to describe Japanese fighter plane pilots, many of whom performed suicide attacks by flying their planes into ships and other Allied targets. The Japanese word, Kamikaze actually means "divine wind." Jyorei or Johrei is a healing art that uses divine light to dissolve the spiritual impurities that are the source of all physical, emotional, and personal problems. 浄霊 / 浄靈 is a Japanese title that can refer to the purification of spirit described above, but this is also the word for exorcism in Japanese. Romanization variations include Jyorei, Johrei, Jourei and Jore. Regardless of romanization, the actual pronunciation is like "Joe Ray." Some people may refer to this entry as Divine Kanji, Divine Characters, Divine in Mandarin Chinese, Divine Characters, Divine in Chinese Writing, Divine in Japanese Writing, Divine in Asian Writing, Divine Ideograms, Chinese Divine symbols, Divine Hieroglyphics, Divine Glyphs, Divine in Chinese Letters, Divine Hanzi, Divine in Japanese Kanji, Divine Pictograms, Divine in the Chinese Written-Language, or Divine in the Japanese Written-Language. 104 people have searched for Divine in Chinese or Japanese in the past year.